On December 19, 1777, the Continental Army, including the North Carolina Brigade, entered winter encampment at Valley Forge, Pennsylvania. Among the North Carolinians present at the Pennsylvania camp was 19-year-old Major Willam Polk. Polk spent much of the harsh winter recuperating. He had been shot through the mouth while shouting orders at Germantown that October—the ball that hit him knocked out teeth and shattered his jaw. After the Revolution, Polk was elected the first president of the State Bank in 1810 and served in that position until 1819. In 1821, he spoke at the dedication of the Canova statue at the State Capitol. Four years, later he welcomed the Marquis de Lafayette, with whom he had fought at Brandywine, to Raleigh and ate breakfast with him at Polk’s North Street home. 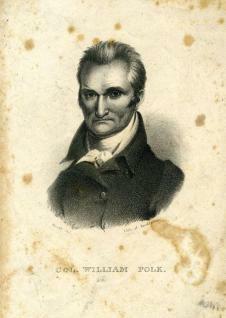 At his death in 1834, Polk was the last surviving field officer of the North Carolina Line.